Harry Potter author J.K. Rowling's 2012 novel The Casual Vacancy is coming to the small screen with the first trailer for this adaptation, debuting in the U.K. Sunday, February 15 on BBC One. We first reported on the mini-series back in April, when HBO and BBC both signed on to produce this adaptation. Isn't isn't known when HBO may release the mini-series in the U.S. quite yet, but, with the arrival of this trailer, we should have more news on the project very soon. The Casual Vacancy centres on Pagford, a seemingly idyllic English village with a cobbled market square and ancient abbey. Behind the pretty façade however, is a town at war: rich at war with poor, teenagers at war with their parents, wives at war with their husbands, teachers at war with their pupils. Pagford is not what it first seems. At the Parish Council meeting the subject of Sweetlove House and its legacy arises. Howard Mollison, the Chairman, heads up the faction who want to see an end to the legacy; the thorn in his side is Barry Fairbrother, who makes an impassioned speech outlining the importance of the legacy, and the services it provides. For now, Barry has won the argument. When Barry dies suddenly, Pagford is left in shock, and the empty seat left by Barry on the parish council soon becomes the catalyst for the biggest war the village has yet seen. Three candidates are soon lined up: Miles Mollison, Howard's son; Colin Wall, Barry's friend; and Simon Price, Barry's half-brother. Rory Kinnear, Simon McBurney and Michael Gambon star in the mini-series adaptation, which Jonny Campbell directed from a script by Sarah Phelps. 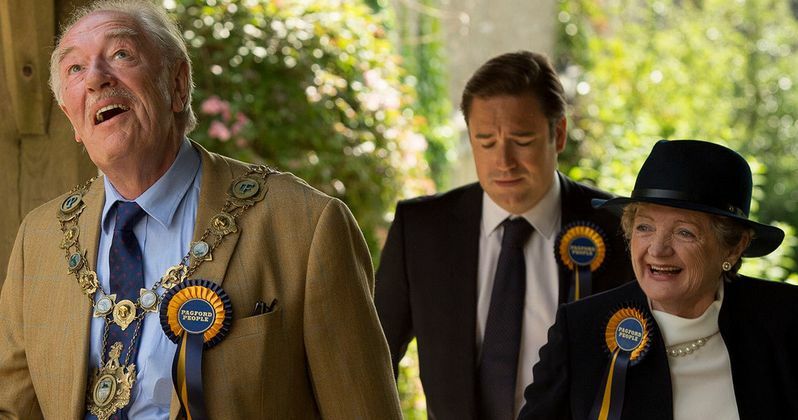 Check out the first footage from The Casual Vacancy, and stay tuned for news on when the mini-series will debut in the U.S.